Alchemy in the Kitchen: Chocolate Éclairs - a 'First Class' Pastry ! Chocolate Éclairs - a 'First Class' Pastry ! For years I thought ‘excursion’ was a euphemism for “let’s take the kids out and see if we can’t all catch pneumonia”. You see, I often visited my Gran for summer holidays in Cork, and she would mastermind 'excursions' to the charming seaside town of Cobh for me and my million-or-so cousins. This was always a recipe for great excitement – cousins you hadn’t seen in a year, a train journey through beautiful countryside, the anticipation of a picnic, the seaside. What more could a bunch of kids want! No matter how blue the sky started out, it always, always, always lashed rain before we got home. I think Cobh has a special soak-you-to-the-skin kind of rain - although we Irish seem peculiarly unable to dress for the prevailing weather so maybe that has something to do with it too. I returned to Cobh recently to meet my beloved’s Californian relatives whose cruise liner had docked for the day. As we waved goodbye, it struck me that almost a hundred years ago, Titanic had been waved off from the same dock. Apart from the Titanic anniversary, I have a special reason for mentioning Cork this week. I am delighted to be running a food blogging workshop next Saturday for Cork City Libraries as part of their World Book Fest Constant Reader programme. If you are in the area, drop in. Free tickets for the event can be booked here. In keeping with the Cork/Titanic theme, Chocolate Éclairs were on the First Class menu that fateful night of 14th April, 1912. If I’d been on board Titanic and somehow managed to sneak into First Class, these are what I would have pinched off the dessert trolley. Simply mix these three ingredients together to make the filling. 2 Remove from the heat, then carefully tip the flour and salt into the liquid in one go. Stir with a wooden spoon until the mixture comes together in a soft smooth ball of paste and no dry flour remains. Spread the ball of paste over the bottom of the saucepan and leave to cool to room temperature. 3 When the paste has cooled, add the vanilla extract to the beaten egg, then add the egg to the paste a little at a time, whisking well between additions. An electric whisk is best for this job. You want a smooth glossy soft paste that will hold its shape so check the mixture as you go along as you may not need to add all the egg. 4 Transfer the mixture to a piping bag with a 1.5cm plain nozzle and pipe lines approximately 10cm long onto a baking sheet lined with non-stick baking parchment, leaving approximately 6cm between pastries. Transfer to the oven. Bake for approximately 20-25 minutes or until evenly golden brown. Remove from the oven and poke a small horizontal slit in the side of each pastry to release some steam. Return to the oven for a further 2 minutes before removing to cool on a wire rack. 5 Assemble the éclairs just before serving: slice them in half horizontally and fill with the flavoured whipped cream. Drizzle a little melted chocolate over each. Tip: Pop a roasting tray with a handful of ice cubes into the bottom of the oven a few minutes before putting the pastries in to bake. This helps create a steamy atmosphere and helps the pastry to puff up beautifully. Loving these always a favorite if infrequent treat. Wow. My husband doesn't like sweets or desserts except for eclairs. He could eat these by the armload. They look beautiful. It reminds me that I should spoil the old man and I'll use your recipe to do it. Thanks! Oh my goodness, this is very tempting. Love the look of the filling oozing out. I can eat a lot of of those Eclairs. I cant wait to try these! They look so delicious! Choux pastry is on the never ending "to do" list, I have never made them before. You did an excellent job on these-they look like they are straight from the bakery. I like that you did just a light drizzle of chocolate, sometimes I think they are a little heavy handed with that here in the states. Simply delicious. Pretty wild that these were on the menu of the Titanic, nice bit of food trivia! Also congrats on the workshop gig, I am sure it will be fun and a worthwhile endeavor! This is a recipe to be bookmarked for sure!! Didn't know that this was served on Titanic! Please drop by my blog http://cosmopolitancurrymania.blogspot.com/, where some awards are waiting for you! Ah I wish I could participate in your workshop, sounds like lots of fun! Eclaire always remind me of summer vacations in north france. 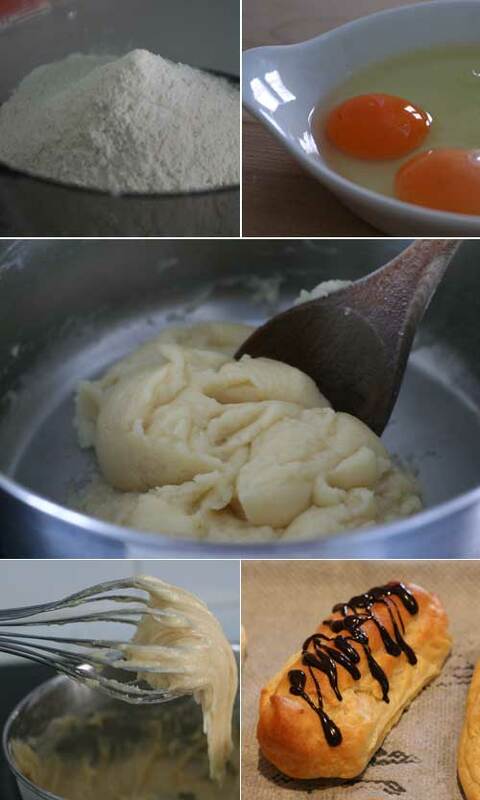 Choux dough is my absolute favourite and the vanilla cream inside a dream! Drooooool ! Have been on a few jaunts/excursions myself - wish they had involved these eclairs ! Totally worth it with the creation of these insanely perfect eclairs - too good! At the beginning I thought you had made the choux pastry tooo.. I was relieved to find that your recipe is idiot proof (for non bakers like me anyway!) Lovely background story too and the leading pic is gorgeous. A.
Wow - I didn't realise this was one of the Titanic menu items, Hester. Ah, that rain that soaks you to the skin. I prefer Scottish drizzle myself - especially your chocolate version on these yummy éclairs! 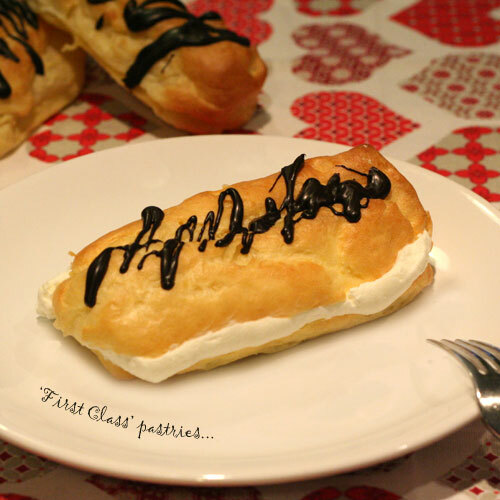 "First class" pastries indeed--eclairs are one of my absolute, all-time favorite desserts. These are spectacular. I did not realize I grew up with weekly excursions! My dad would always plan adventures to get us out of the house and give my mom some peace. Your eclairs look amazing!!!! Sounds like a lovely childhood memory- even if you always ended up soaking! Your eclairs look magical!! When are you coming to Cayman for a workshop? Hmmmmmmm? @ Parsley Sage - I'm there in a heartbeat! This is absolutely first class! My version of an excellent excursion will always be synonymous with food...so if I cannot squeeze in a real excursion, I may just have to do a bit of cooking, and baking and indulging in great, good food. Like these eclairs!!! Oh I love eclairs - those look simply delicious. I never knew what port the Titanic set sail from so thanks for the fun fact :) I'm sure it's randomly come in handy during trivia one night since they're re-releasing the movie! 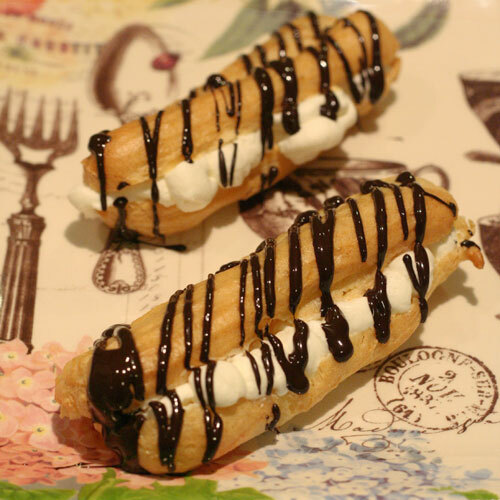 These eclairs look FANTASTIC!!!!!! And congrats on your workshop! I look forward to hearing all about it! Te han quedado estupendos ...maravillosos me quedo en tu cocina,te invito a que conozcas mas de mi cocina chilena,hugs,hugs. eclairs look yummy.One of my favorite. Asparagus – a feast of ferns !